A foreign national has died following an altercation with Canada border security at an airport. Officials from Canada Border Services Agency (CBSA) say the man was being removed from the country. 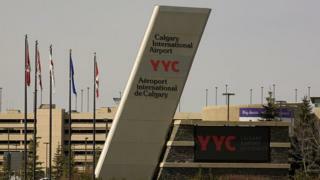 The man got into an altercation with two CBSA guards on board a flight leaving Calgary International Airport. He then went into medical distress, and was pronounced dead in hospital. The incident is now being investigated by Calgary police, officials say. "On August 7, 2018, while attempting to remove a foreign national from Canada, an altercation took place between the individual and the two CBSA officers on board a flight from Calgary prior to its departure," a statement from CBSA said. "The individual went into medical distress and was transported to hospital where he was later pronounced deceased." CBSA did not release the identity of the deceased, nor his nationality. An autopsy is scheduled for later on Wednesday.